With a stay at Clinipel Hotel - Empório & Spa, you'll be centrally located in Gramado, steps from Gramado City Hall and minutes from Belvedere Viewpoint. Featured amenities include dry cleaning/laundry services, a 24-hour front desk, and multilingual staff. Free valet parking is available onsite. With a stay at Alpenhaus Pousada in Alto da Boa Vista, you'll be in the mountains, within a 10-minute drive of Boa Vista Palace and Felicia Leirner Museum. Free self parking is available onsite. With a stay at this apartment in Alto da Boa Vista (Ipanema), you'll be minutes from Praca General Osorio and Arpoador Beach. A roundtrip airport shuttle is available for a surcharge. With a stay at Swan Express Rio Grande in Rio Grande, you'll be just steps from Rio Grande Library and Xavier Ferreira Square. Free self parking is available onsite. 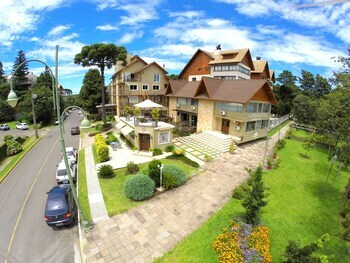 With a stay at this chalet in Gramado, you'll be within a 10-minute drive of Mini Mundo and Black Lake Park. Free self parking is available onsite. With a stay at Small Porto Hotel in Porto Seguro, you'll be within a 10-minute walk of Cruzeiro Beach and Avenida Shopping Center. Featured amenities include a 24-hour front desk and luggage storage.